In May 1999, actress Nancy Barrett visited Seaview Terrace, the house which was used as the exterior of the haunted mansion Collinwood on Dark Shadows. Nancy portrayed Carolyn Stoddard on the show. 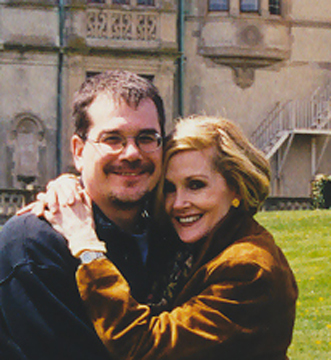 Along with director Jim Pierson and camera man Dennis Baker, Nancy was at Seaview to film "Dark Shadows On Location," part of a documentary about the making of Dark Shadows, which was released by MPI video later that year on The Dark Shadows Video Scrapbook tape. With my trusty 35mm camera in-hand, I was along to document the trip. We arrived at Seaview Terrace, fittingly, at dusk -- the time of day when vampire Barnabas Collins would begin stalking the grounds of Collinwood on the show. The next day, Seaview Terrace was visible in all its glory in bright sunshine. Seaview Terrace was built in 1928 at a cost of more than two million dollars. 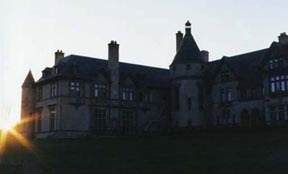 The building has 65 rooms and is currently used as a student dorm (and classroom space) for the Salve Regina College. It was the first time Nancy Barrett had visited Seaview Terrace since 1966 -- when she filmed some Dark Shadows exteriors there. Now, more than 30 years later, she'd returned to host part of a new documentary produced by MPI. We also visited several other locations used as DS exteriors. Coming soon to DSO: a gallery of photos I shot during our weekend at Collinwood and the other locations. For more stories about the Dark Shadows cast, check out Barnabas & Company, available on Amazon.com.